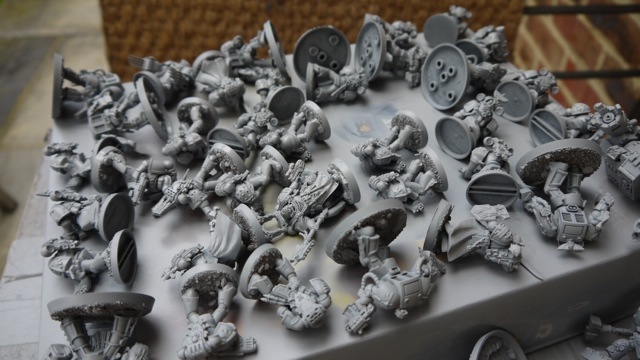 For those that haven’t heard of the awesome Robin Fitton, he’s the genius behind Gruntz 15mm. If you haven’t heard of the game flagellate yourself then click here. 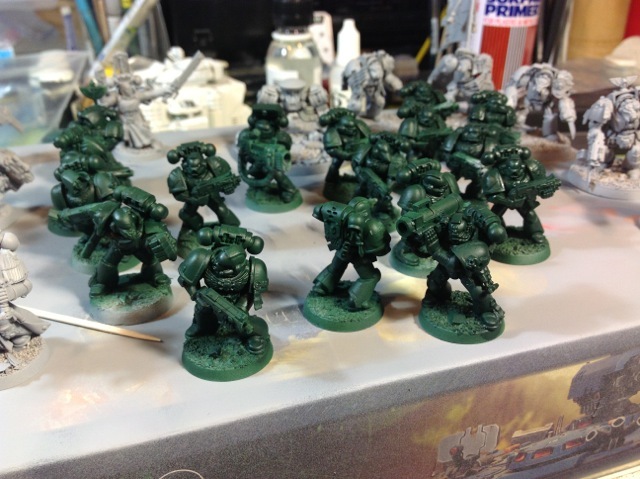 Phase 1 : Initial construction and base spray coating on a Dark Angels force. 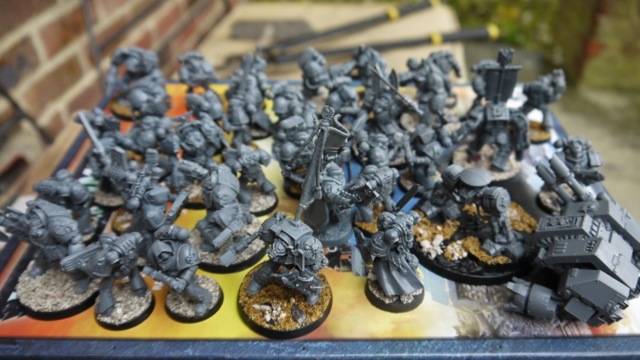 I recently bought the Warhammer 40K Dark Vengeance and decided to build a Dark Angel force using the models in the box as a base. The chaos models from the box set were sold to a friend but I was sad to see them go because the detail level was very good. 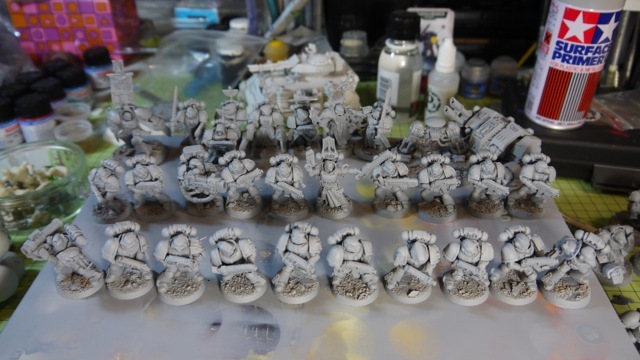 I have 30 years experience of painting and playing wargames but have not played 40K since the days of Rogue Trader rules, when I had a mix of Imperial Guard and Space Marine models. Now drawn back to the game with this latest set of rules I decide to follow the guides provided by GW for the paint work. 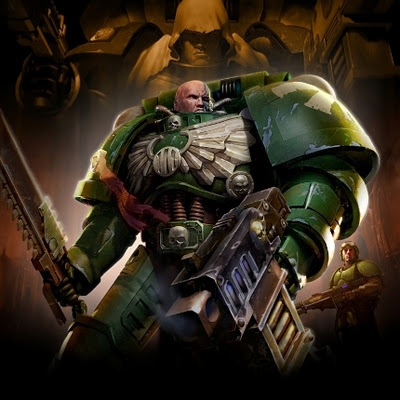 I am following the “How to paint Dark Angels” iPad book from Games Workshop and I am going to use almost exactly the technique they suggest in the guide. The Citadel paints from the new 2012 range will be used for all the paint work with the possible addition of the odd non-GW paint, thinner or wash where appropriate. The iPad painting guide is straight forward with some nice stage by stage images, however the first 3 stage images on of the Dark Angel space marine is very “Dark” and considering that I am viewing on a super sharp iPad retina display I would like to think that they could have done a better job of the photography. It is interesting how they suggest airbrushing them in the guide to complete a base coat but they don’t provide any tips on how to do it. I have been airbrushing for about 6 years, so I am familiar with the technique and it would have been great to see at least a photo in the iPad guide of the airbrushing or painting stages. There are also no tips on actual brushing in the guide with no video content. It just shows you what sized GW brush to use and the only video is a 3 second Games Workshop logo that appears when you open the iBook. The construction of the miniatures from the box set was very easy. What I did not factor into the time frame was the amount of mould lines on the models that would need cleaning. They have done a good job with the models and a lot of the plastic lines are hidden behind joins but I boosted the basic set with 10 tactical squad members which added to the clean up. 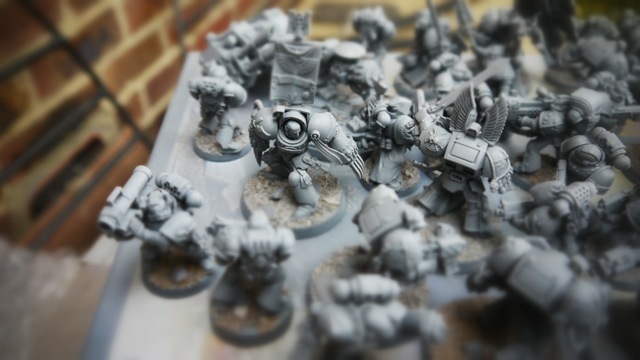 The main clean up locations on a space marine are the outside and inside legs, arms (wrists), the rounded exhausts on the back packs, the top of head seam, the weapon seam (down the centre line of the bolters) and last but not least the top of the back pack. The top of the backpack is an ugly spot. It is slightly recessed, so you can’t easily get a knife in to clean it up. If it is a model that you are adding a plastic symbol to you can hide the top of the back pack. All of these lines were cleaned up using a fresh sharp blade and I use a subtle scraping action along the lines to scrub them off, rather than cutting a hack through them. I then finished off most of the tidy up with some ultra fine sandpaper from Tamiya. This is made for plastic manga kits and does a great job of cleaning up the edges and seams without making them rough. Weapon barrels were all drilled out and the bikes had their exhausts drilled (photos of bikes in next phase). I took a lot of care and about 3 weeks to slowly prepare the models. This was completed in front of the TV with the family and was probably about 12 hours total prep time over the course of 3 weeks. There are an additional 5 terminators and 10 space marines plus a dreadnought in this prep. Despite the hours and effort I still missed the odd line or edge on the models, but I am happy with the overall result. Before priming I based the models using a mix of coral sand, GW gravel and other chunks of slate. I use neat PVA glue to stick on the sand, then once dry it gets a water thinned extra coat of PVA to seal the sand onto the bases. Sealing the sand makes it rock hard, like mini-concrete bases and won’t rub off. For the base primer spray I used Tamiya fine grey, instead of the black from GW. The black would not take the dark green very well when airbrushing and I prefer to be able to see the colour going onto the model when airbrushing. So the mid tone grey from Tamiya is perfect for me. I always lay them down for a final spray to make sure the primer has got in all the nooks and crannies. 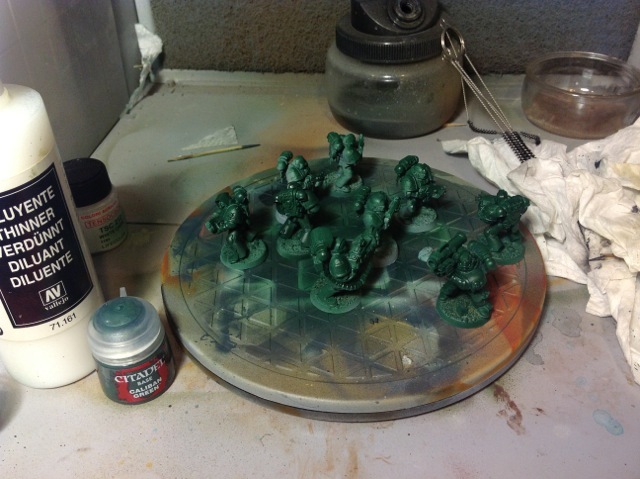 I used the Valejo airbrush thinners with the Caliban green from GW and it thins it down perfectly. I was worried the thinner would react with GW paint but it was spot on and mixed up well with a cocktail stick before poor the result into the airbrush. Getting the mix right to thin the thick GW paint takes some care and I end up with a liquid with the consistency of milk. You can watch my airbrushing tutorial at the bottom of the page. I was impressed by the speed of the new GW painting guide, it is all about getting the best tabletop look to the model but with minimum time. 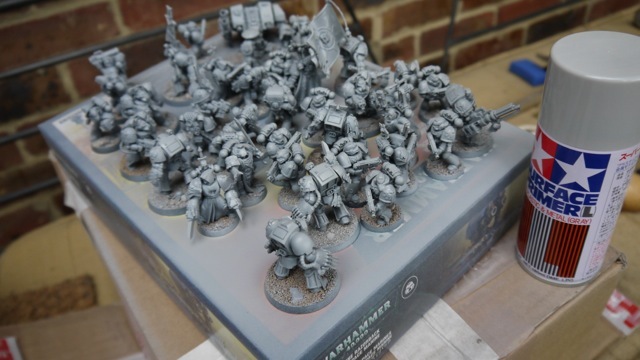 However if you want to follow the guide fully for the Dark Angels you need about 35 pots of the new paint which is expensive and in many cases they appear to switch to a different grey or brown colour on some details which you could get away with using a similar colour on, rather than buying about 40% of the new colour range. wheres the rest? You should have called this basing dark angels rather than painting them. As and when the contributor has time to write the second part of his article it will go up.